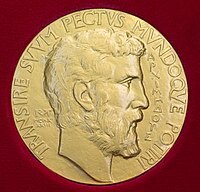 ↑ "2006 Fields Medals awarded" (PDF). Notices of the American Mathematical Society. American Mathematical Society. 53 (9): 1037–1044. October 2006. ↑ "Reclusive Russian turns down math world's highest honour". Canadian Broadcasting Corporation. 22 August 2006. Retrieved 26 August 2006.